Heat 10-inch nonstick skillet over medium-high heat; add oil. Season both sides of pork with salt and pepper. Add to skillet. Cook 2 to 3 minutes on each side or until golden brown outside and no longer pink in center. Transfer pork to a plate; cover with foil. Reduce heat to low. Add jam, vinegar and 2 tablespoons of the water to skillet. Cook about 1 minute or until sauce comes together; add more water if sauce is too thick. Season to taste with salt and pepper. Make polenta as directed on package; stir in cream cheese and butter. In microwavable bowl, microwave mixed vegetables and 2 tablespoons water uncovered on High about 4 minutes or until hot. 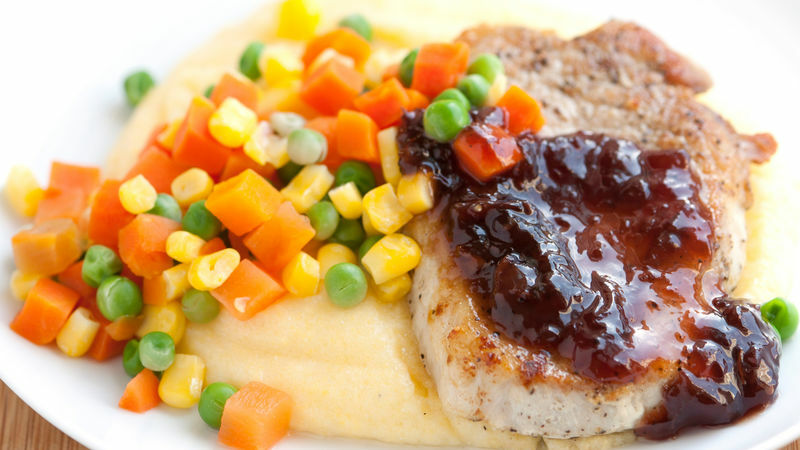 Serve by adding a spoonful of polenta to a plate and topping it with a pork chop, vegetables and cherry sauce. Replace polenta with brown or white rice. Instead of cherry jam, use strawberry or blackberry jam. Cascadian Farm is a registered trademark of Small Planet Foods, Inc.